What is Move Free Advanced Plus MSM? 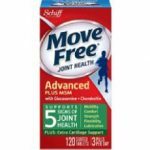 Move Free Advanced Plus MSM is a joint health supplement that delivers a multi-pronged approach to promote joint health and protect it from deterioration caused by aging, injury and overuse. This supplement promotes mobility, flexibility, strength, lubrication and comfort. This supplement provides benefits that can be seen over the short and long term. Results point to increased range of motion as well as decreased rate of joint, structure and cartilage deterioration. Who is the Manufacturer of Move Free Advanced Plus MSM? Reckit Benckiser, makers of Veet, Lysol and Strepsils, is the company behind the manufacturing and distribution of this joint health supplement. It is one of several products that promote joint health that the company acquired from Schiff Nutrition in 2012. Schiff Nutrition, the company that originally formulated Move Free products, was founded in 1936 by Eugene Schiff, a pharmacist who turned to the power of natural foods to help the body improve its efficiency to deliver healing and enhance long-term health and well-being. How Does Move Free Advanced Plus MSM Work? This supplement works to deliver its claims by combining glucosamine and chondroitin. This combination is essential in improving joint lubrication and water retention. This results in greater freedom and comfort of movement, as well as significantly improved range of motion. In this variation of Move Free, the manufacturer infuses the formula with Uniflex, a proprietary complex of minerals derived from fruits and vegetables, that help promote better joint health and protect joints from damage and early aging. Move Free Advanced Plus MSM Ingredients – Are they Safe & Effective? Glucosamine: It is essential in restoring damaged joints, particularly supporting the production of new cartilage to help heal tears and injuries. Chondroitin: It works with glucosamine in forming new cartilage that promotes healing, lubrication, and protection of the joints from further deterioration. Hyaluronic Acid: It provides much-needed cushioning and lubrication to the joints, resulting in comfortable, less painful movements. Uniflex: This proprietary complex of nutrients derived from fruits and vegetables provides the joints protection from aging and damage. MSM: It supplies the body with added amounts of sulfur that support the optimal production of collagen, the building blocks of bones, joints and cartilage. What are the Advantages of Move Free Advanced Plus MSM? Positive results may become distinguishable as early as the second week of daily supplementation. The manufacturer claims that this supplement has been formulated to promote enhanced mobility, flexibility, lubrication, comfort and strength which all contribute to joint health. This supplement is manufactured by a company with a long-established track record in developing and marketing nutraceuticals. It delivers a multi-pronged approach to arrest joint deterioration and provide protection from further aging and damage at the same time. Collagen formation is enhanced with the addition of MSM which helps boost the beneficial effects of Glucosamine and Chondroitin. What are the Disadvantages of Move Free Advanced Plus MSM? This supplement may only be available for online purchase and is not available in stores. Glucosamine and chondroitin are popular joint health ingredients but real benefits are likely to be modest. This supplement will not provide immediate relief from joint pain and stiffness. The product will affect users differently depending on the state of their joints. This product does not offer any novel ingredient nor make any new claim concerning joint health. How Should You take Move Free Advanced Plus MSM? You must take 3 tablets once with a meal every day. Alternatively, you may take 1 tablet per meal three times daily. How Much Does Move Free Advanced Plus MSM Cost? A 120-tablet bottle of this supplement costs $17.09 when purchased from the manufacturer’s online store. In leading reseller sites, this product is can be sold by as much as $36. What is Move Free Advanced Plus MSM’s Return Policy? All purchases made from the manufacturer’s online store are covered by a 30-day refund if, for whatever reason, users are not satisfied with the product. Items that are no longer resalable are charged 15% of the original price. Does Move Free Advanced Plus MSM Offer a Free Trial? It appears that this product is not available for a free trial arrangement. This appears to be a good joint pain relief product among users. It is formulated with key ingredients tightly linked to joint health although, it obviously uses the same key ingredients — glucosamine, chondroitin and MSM — that most other joint health supplements are also made of. This product does not provide any innovative formula, therefore, that cannot be easily sourced from a similarly formulated product offered under a different brand name. It will be helpful to compare and contrast product formulation and pricing before making a buying decision concerning this product.